BOISE, Idaho – The University at Buffalo ran out of March Madness magic Saturday. The Bulls were defeated by the University of Kentucky, 95-75, in the second round of the NCAA Tournament. Kentucky's size and athleticism was too much for the Bulls. 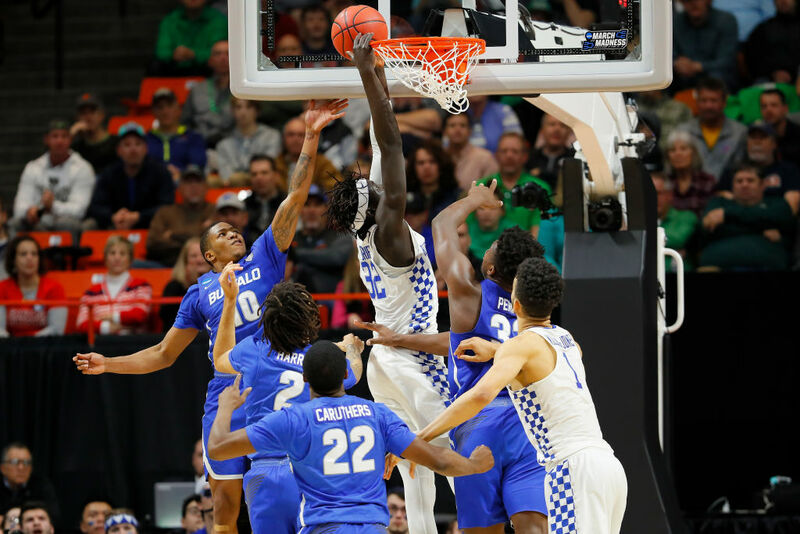 UB could not stop Kentucky's 6-foot-6 point guard, Shai Gilgeous-Alexander from getting to the rim. He scored 27 points. The Wildcats got 22 of their 36 field goals on layups or dunks. UB, ranked sixth in the nation in scoring, played reasonably well on the offensive end. Kentucky ranks 25th in the nation in defensive efficiency. The Bulls were on pace for the season average of 85 points a game at the half, when they trailed, 51-42. But when UB went on defense, it could not come up with an answer for a Kentucky team that boasts seven freshmen who were ranked among the top 50 high school recruits in the nation. Kentucky (26-10) advanced to the Sweet 16 for the seventh time in the last eight years. The greatest basketball season in UB's history ended at 27-9. Senior point guard Wes Clark was brilliant for UB, scoring 26 points. UB was within four with 15 minutes left and within 5 with 8:10 left. But that's when Kentucky went on a 12-2 run to take an 84-69 lead. UB made 15 of 30 three-pointers in the upset of Arizona on Thursday. The Bulls couldn't repeat the hot shooting. They made just 7 of 31 from behind the arc. The Wildcats' rank 22nd in the nation in field-goal percentage defense and No. 4 in defending three-point shots. In the zone: Kentucky is known for playing man-to-man defense almost exclusively under coach John Calipari. In his first eight seasons the Wildcats never played zone defense on more than 5 percent of possessions. This year, the Wildcats still rely mostly on man guarding but they played zone 17 percent of possessions. In the first half, Kentucky used zone on only two UB possessions. Calipari knows D: Calipari's teams have ranked among the top 30 in the nation 14 of the last 17 seasons in field-goal percentage allowed. His teams have been in the top five six of those seasons. NBA pipeline: Kentucky had 27 players on NBA rosters as of opening day this season. Duke was second with 20 players. North Carolina and Kansas were tied for third with 16. Calipari has seen 24 UK players drafted in the first round the past eight years. A current top-five NBA Wildcats arguably would include Anthony Davis and DeMarcus Cousins of New Orleans, Karl Anthony-Towns of Minnesota, John Wall of Washington and Jamal Murray of Denver.